Captain Kirk (released in January): Amazon.com, Amazon.co.uk, Amazon.ca, Amazon.de, Amazon.fr, Things From Another World, Entertainment Earth, Forbidden Planet. Captain Picard (released in January): Amazon.com, Amazon.co.uk, Amazon.ca, Amazon.de, Amazon.fr, Amazon.it, Things From Another World, Entertainment Earth, Forbidden Planet. 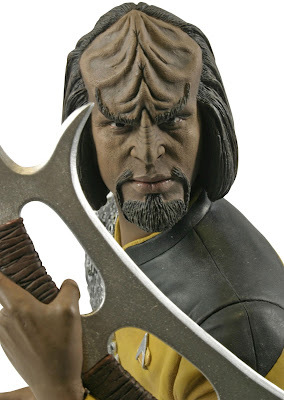 Khan Noonien Singh (expected April): Amazon.com, Amazon.co.uk, Amazon.fr, Things From Another World, Entertainment Earth, Forbidden Planet. 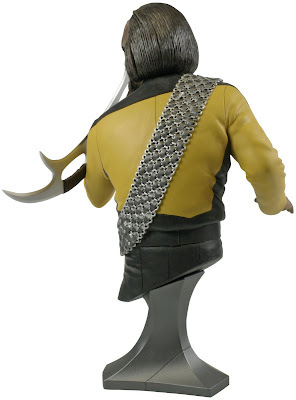 Commander Spock (expected June): Amazon.com, Amazon.co.uk, Amazon.fr, Entertainment Earth, Forbidden Planet. 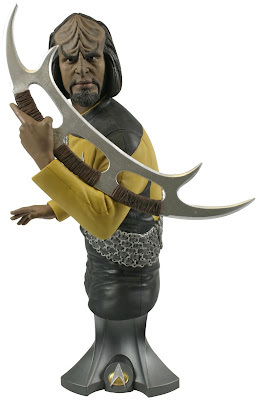 Doctor Leonard McCoy (expected June): Amazon.com, Amazon.co.uk, Amazon.fr, Entertainment Earth, Forbidden Planet. Lieutenant Commander Data (expected June): Amazon.com, Amazon.co.uk, Amazon.fr, Entertainment Earth, Forbidden Planet. Also on the way, announced at the same time as the Worf bust at last year's Comic Con, are Uhura and Scotty.